In conjunction with the recent release of BlogrStore Responsive V1.1, a free Blogger template featured packed e-commerce blogshop /store, the designers and developers are releasing yet another free simplified invoice email template for it's users. Currently in their radar, 3 more Blogger store with shopping cart templates will be released soon :-) and the plug-in will be installed accordingly. For previous template users, no worries! With a simple add-in / replace codes, you too can use the simple email invoice template. Refer down below for the simple tutorial to include this feature with template codes and tutorials provided. Included the postal code right after the address section. If the user did not include their postal code, an empty box would not be displayed in the email invoice body. You can also omit the postcode form input and find the how to in the Blogger template tutorial / download comments section. Moved users comments in the users data section. We found out through feedbacks from our clients and users, thier customers have very specific comments for blog shop / store owner, especially on delivery etc. This allows the comments to be easily referred by blog-shop / store owners on the send order. Removed the " ... Banking Institution... " text and replaced with " Preffered Transactions " and also re-arranging the name and account number. This still allows blog-shop owners to include 3 banking institution of choice but muuch more straight forward with the bank name, the account number and full account name in one line. Removed " ...additional information and updates ... " and replaced with "General Notes"
Here, blogshop / store owners can include important notices of choice to your users within the template codes itself. 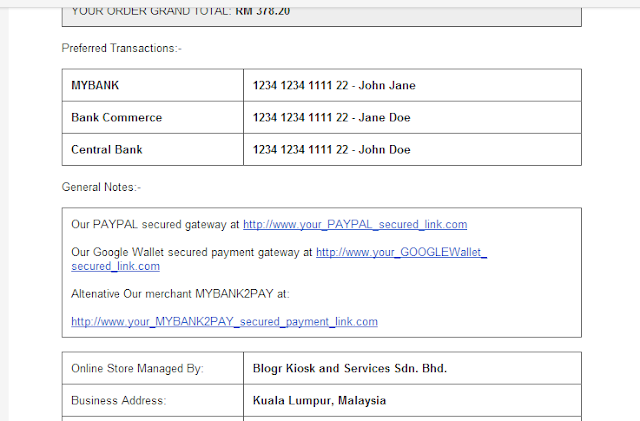 While still using the existing codes, each " data: ... " will display in a single line on the email invoice body. Works great with promotional offers, current news, new product links etc. 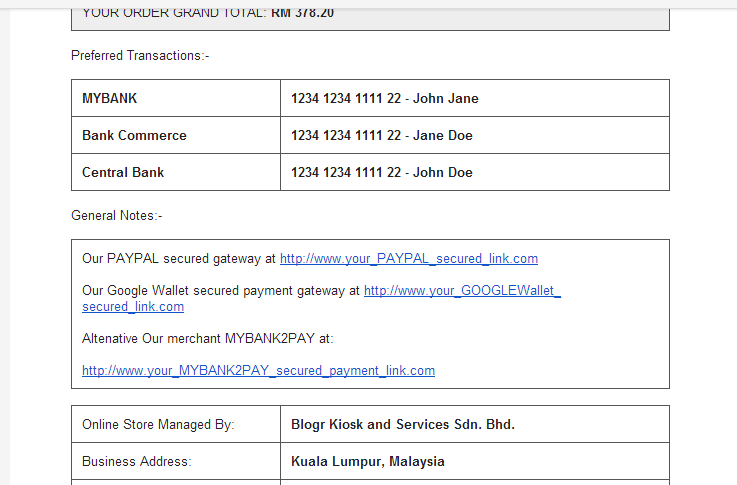 And finally, removed the payment transaction prompt and also the ugly IMPORTANT NOTICE. Even though it is removed, if a blogshop owner requires the important notices, they can simply add in in the General Notes section, it's just plain simple. So, any text written in between the template codes, will automatically display in the respective section. How to use the New Shopping Cart Simple Email Invoice Template? In Template > save current template (if required) > Edit HTML > scroll down to the bottom of the template. 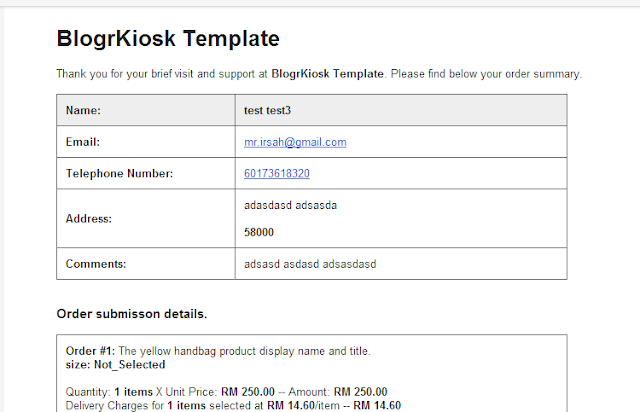 Click Save Template to save your blogshop template and test your checkout form by selecting a product > add to cart > fill the form > click Send Order. You can also test the new look shopping cart invoice email simple template at our test blogr template collection here http://test-irsahcom.blogspot.com/index.html . Although it might be temporary but we will update on the other template releases soon.